Equivalent by some estimates to a computer with a 1 trillion bit per second processor. Estimates of the human brain’s memory capacity vary greatly from 1 to 1,000 terabytes (for comparison, the 19 million volumes in the US Library of Congress represents about 10 terabytes of data). Information transmission within the brain, such as takes place during the processes of memory encoding and retrieval, is achieved using a combination of chemicals and electricity. It is a very complex process involving a variety of interrelated steps, but a quick overview can be given here. The core component of the nervous system in general, and the brain in particular, is the neuron or nerve cell, the “brain cells” of popular language. A neuron is an electrically excitable cell that processes and transmits information by electro-chemical signalling. Unlike other cells, neurons never divide, and neither do they die off to be replaced by new ones. By the same token, they usually cannot be replaced after being lost, although there are a few exceptions. Unlike most body cells, neurons in the brain are only able to divide to make new cells during fetal development and for a few months after birth. After that, no new brain cells are formed, although existing ones may increase in size until the age of about eighteen years. They are designed to last a lifetime. The process by which this information is communicated is called synaptic transmission and can be broken down into four steps. First, the neurotransmitter must be synthesized and stored in vesicles so that when an action potential arrives at the nerve ending, the cell is ready to pass it along to the next neuron. Next, when an action potential does arrive at the terminal, the neurotransmitter must be quickly and efficiently released from the terminal and into the synaptic cleft. The neurotransmitter must then be recognized by selective receptors on the postsynaptic cell so that it can pass along the signal and initiate another action potential. Or, in some cases, the receptors act to block the signals of other neurons also connecting to that postsynaptic neuron. After its recognition by the receptor, the neurotransmitter must be inactivated so that it does not continually occupy the receptor sites of the postsynaptic cell. Inactivation of the neurotransmitter avoids constant stimulation of the postsynaptic cell, while at the same time freeing up the receptor sites so that they can receive additional neurotransmitter molecules, should another action potential arrive. A typical neuron possesses a soma (the bulbous cell body which contains the cell nucleus), dendrites (long, feathery filaments attached to the cell body in a complex branching “dendritic tree”) and a single axon (a special, extra-long, branched cellular filament, which may be thousands of times the length of the soma). Every neuron maintains a voltage gradient across its membrane, due to metabolically-driven differences in ions of sodium, potassium, chloride and calcium within the cell, each of which has a different charge. If the voltage changes significantly, an electrochemical pulse called an action potential (ornerve impulse) is generated. This electrical activity can be measured and displayed as a wave form called brain wave or brain rhythm. This pulse travels rapidly along the cell's axon, and is transferred across a specialized connection known as a synapse to a neighbouring neuron, which receives it through its feathery dendrites. A synapse is a complex membrane junction or gap (the actual gap, also known as the synaptic cleft, is of the order of 20 nanometres, or 20 millionths of a millimetre) used to transmit signals between cells, and this transfer is therefore known as a synaptic connection. Although axon-dendrite synaptic connections are the norm, other variations (e.g. dendrite-dendrite, axon-axon, dendrite-axon) are also possible. Each individual neuron can form thousands of links with other neurons in this way, giving a typical brain well over 100 trillion synapses (up to 1,000 trillion, by some estimates). Functionally related neurons connect to each other to formneural networks (also known as neural nets or assemblies). The connections between neurons are not static, though, they change over time. The more signals sent between two neurons, the stronger the connection grows (technically, the amplitude of the post-synaptic neuron’s response increases), and so, with each new experience and each remembered event or fact, the brain slightly re-wires its physical structure. The interactions of neurons is not merely electrical, though, but electro-chemical. Each axon terminal contains thousands of membrane-bound sacs called vesicles, which in turn contain thousands of neurotransmitter molecules each. Neurotransmitters are chemical messengers which relay, amplify and modulate signals between neurons and other cells. The two most common neurotransmitters in the brain are the amino acids glutamate and GABA; other important neurotransmitters include acetylcholine, dopamine, adrenaline,histamine, serotonin and melatonin. During childhood, and particularly duringadolescence, a process known as "synaptic pruning" occurs. Although the brain continues to grow and develop, the overall number of neurons and synapses are reduced by up to 50%, removing unnecessary neuronal structures and allowing them to be replaced by more complex and efficient structures, more suited to the demands of adulthood. When stimulated by an electrical pulse, neurotransmitters of various types are released, and they cross the cell membrane into the synaptic gap between neurons. These chemicals then bind to chemical receptors in the dendrites of the receiving (post-synaptic) neuron. In the process, they cause changes in the permeability of the cell membrane to specific ions, opening up special gates or channels which let in a flood of charged particles (ions of calcium, sodium, potassium and chloride). This affects the potential charge of the receiving neuron, which then starts up a new electrical signal in the receiving neuron. The whole process takes less than one five-hundredth of a second. In this way, a message within the brain is converted, as it moves from one neuron to another, from an electrical signal to a chemical signal and back again, in an ongoing chain of events which is the basis of all brain activity. Once the postsynaptic ion channel is opened, whether directly or indirectly, the effect can be either excitatory (depolarizing) or inhibitory (hyperpolarizing). Reuptake: The neurotransmitter can reenter the presynaptic cell through channels in the membrane. Most neurons contain both types of vesicles, but in different concentrations. Used everywhere in the brain. For example, memory systems of the CNS (may be related to Alzheimer's Disease). Is the direct precursor to norepinepherine. Synthesis: Neurotransmitters are synthesized by the enzymatic transformation of precursors. The biosythetic pathway can be immediate (as in GABA from glutamate) or in multiple steps (as in epinepherine from norepinepherine from dopamine, etc.). 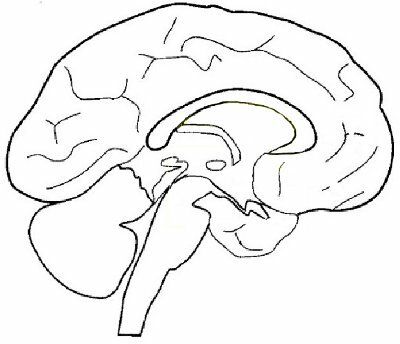 The synthesis occurs either at the terminal boutons of the axon, or in the soma. In the latter case, it is transported to the axon terminals probably by way of microtubular tracks. Storage: They are packaged inside synaptic vesicles. These vesicles vary in size, depending on the size of the neurotransmitter. Binding: The neurotransmitters bind to receptor proteins imbedded in the postsynaptic cell's membrane. There are two kinds of receptors: ionotropic (direct) and metabotropic (indirect).